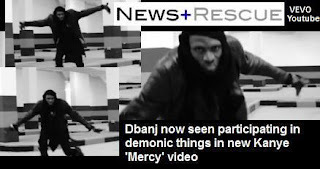 At first it wasn’t clear to fans the real motive behind D’banj’s clamouring to be signed under Kanye West Good Music record label, until when the Donjazzy Enigma beat and D’Banj’s Oliver Twist single and video was posted. This attracted so many comments, both positive and negative, and was linked to the biggest urban occult group in the world music scene, THE ILLUMINATI. 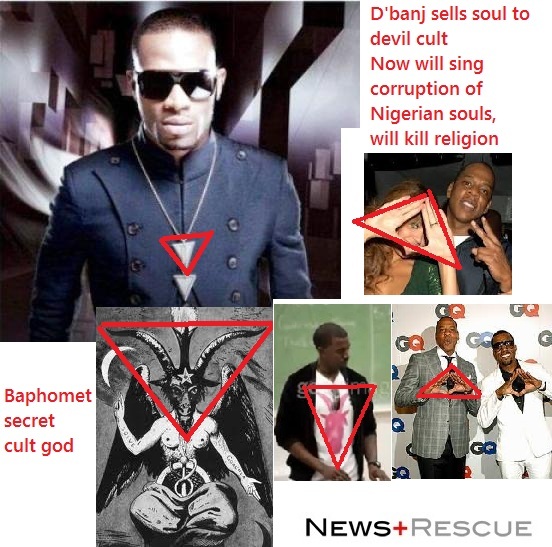 Nigerian megastar entertainer, Dapo Oyebanjo popularly known as D’Banj, and other members of Mo’Hits record label led by ace producer, Don Jazzy, are confirmed members of the urban-secret cult, THE ILLUMINATI. Certain proof was offered by artists of the record label themselves, causing Nigerians to comment negatively on the new video which was kind of different and funny but has a hidden meaning. The proof in query is a video clip produced by the record label in which D’Banj, Don Jazzy, Doctor Sid, Wande Coal and an unidentified man dance like gay men to D’Banj’s new single, Oliver Twist. An expert and leading name on everything Illuminati, Doctor Zen Solonso, analyzed the video and exposed all of the concealed Illuminati symbols in it and according to him, one of the largest objectives of the Illuminati is to turn everybody to gay. This is the reason their known members like Kanye West and the rest are gay. It might be remembered that D’Banj and Don Jazzy have just signed on to Kanye West’s record label. In the group’s Oliver Twist video, they don’t only dance like gay, they also invite people to record their own Oliver videos and post it to them at olivermohitsrecords.com. And they further lured folk with thousands of bucks that’ll be paid for the best video. Donjazzy’s Enigma beat, which sounds like the beat of an occult group, was also given out for upcoming artistes to flow on and the best will smile home with $2,000. Already there is a large number of videos on social internet video site Youtube showing younger people, both male and female, dancing seductively to the Oliver Twist song. Doctor Solonso indicated that in the group’s video, Don Jazzy is wearing what seem to be checkered trousers. “This swapping pattern of white and black squares is the Illuminati’s mind control method,” he claimed. Indeed, according to the expert, the song’s familiar tune and highly danceable sound is down to Don Jazzy’s pants. The occult research expert also indicated that at some specific point in the video the unidentified man walks across the camera, holding a red bag and what appears to be a horn. Eventually, the expert turned the spotlight on the sound speakers and other electronic apparatus organized to spell the word ILLUMINATI behind the artists as they dance seductively around. This, according to him, is the most powerful proof the song and the video, and the invitation to their fans to do their own Oliver Twist videos are nothing other than an Illuminati plot to turn Nigerians into gay. On the other hand, its has been observed that D’banj has been wearing a set of triangular pendants since he returned from his trip before he joined the presidential campaign train of Goodluck Jonathan earlier this year, which is very similar to the Illuminati symbol, as it is an open secret that the Pyramid which some cult see as the All Seeing Eye has always being a symbol of the Illuminati group and Kanye West always has some elements of the triangle as part of his identity/dressing. Kanye West is one of today’s most popular and controversial performers. Often heralded as an innovative force in the music industry, some of his choices both in video and song have raised eyebrows. 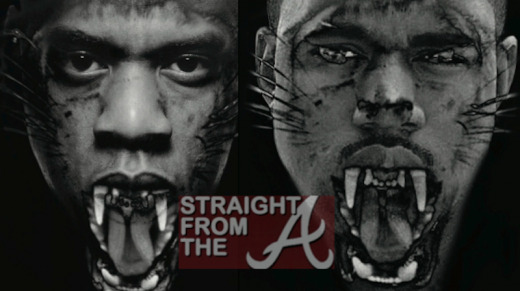 For some time some researchers have been conducting researches into the activities of the cult analyzing the videos of the two popular American artistes, Kanye West and Jay Z, and their analysis raises some questions that we will repeat for your consumption and consideration. One video starts with Kanye West glowing as if the light is within him in the dark, and this can only mean he’s a member of Illuminati. He was also standing between two poles, that usually means the present and the past or the present and the future, according to the teachings of old religion. Whichever way it is viewed it represents “wisdom” in Masonic symbolism. The next thing the researchers talked about is the big chain with Horus’ head as a pendant. Horus is an ancient Egyptian deity that has an extreme importance in occult mysteries. Horus is considered to be the Sky god; he is more often represented with the symbol of a single eye. The Eye of Horus is an ancient Egyptian symbol of protection and royal power from deities, in this case from Horus or Ra. “Horus, the son of Osiris and Isis, was called “Horus who rules with two eyes.” His right eye was white, representing the sun, while his left eye was black, representing the moon. According to Egyptian legend Horus lost his left eye during a fight with his murderous uncle, Seth, to revenge his father’s death. Seth tore out his nephew’s eye but lost the fight because the assembly of the gods declared Horus the victor. The eye was reassembled by the magic of Thoth. Then Horus gave the eye to Osiris, who experienced rebirth in the underworld.” – Jordan Michael, Encyclopedia of Gods. The Illuminati was actually founded years ago and today, points to an organization that many believe controls this country and its corporations (this includes the media, government, buildings, etc.). It also refers to the idea of the establishment “New World Order”, a phrase you might have heard various presidents say during speeches. Furthermore, this idea also stretches to Freemasonry and people who are claimed to be a part of the Illuminati include David Rockefeller, the Bush family, Winston Churchill, Barack Obama, etc. The most recognized sign of the Illuminati is the All-Seeing Eye. Not sure what this is? Take a dollar bill and turn it around and you will see Eye of Horus, the All-Seeing Eye. (You will also see the phrase for New World Order. Also, when a star is drawn to separate the eye from the rest of the pyramid, the stars points land on five letters which spell “mason”). This is as much as I will comment on this part as I could write several pages on it. Feel free to research more. Over the years, many have pointed out that Jay-Z’s “Rocafella” sign is similar to that of the All-Seeing Eye. (Also note that Rocafella sounds a whole lot like Rockefeller). Also, his clothing line “Rocawear” has images of the Eye of Horus on them. This has led many to believe that he is in fact a part of this group. Over time, the rumors have gone a step further by suggesting that he in fact worships Satan. As proof, many point to his lyrics such as the one in “ Empire State of Mind” that states, “Jesus can’t save you, life starts when the church ends”. Taking into consideration the latest relationship between D Banj and Kanye West, the Oliver Twist song and video, the All Seeing Eye pendant, his bisexual nature as he was once sighted in a place where known Nigerian gays patronize, and many other things that are pointing to the fact that this son of a retired soldier turned pastor might be dabbling into the world of occult for fame and money are becoming enormous everyday. JOIN THE ILLUMINATI FROM NIGERIA, USA, OR ANYWHERE IN THE WORLD TODAY BE RICH, FAME, AND POSSES POWER.email us on info willamschurchill@gmail.com OR call us on +2348163974382 for immediate initiation New members registration is now open online now !!!!! WELCOME TO THE GREAT TEMPLE OF ILLUMINATI. ever you need in life, email us on our direct email willamschurchill@gmail.com or call +2348034084260. Congratulations! You've Been Invited to Join the Illuminati! Fame we speak, riches is ours, power belongs to us. join the great Illuminati to achieve all your goals in life. never let this opportunity pass you by. if you desire to be famous then join the ILLUMINATI today and see the difference. for more info contact illuminati835@gmail.com or visit us on our Facebook address at ILLUMINATI FREEMASON. you can call our hotline on +12134556009 or +2348082408303 for more information. earn the sum of $200,000 as the illuminate membership salary monthly.